We’ve compiled a comprehensive list of North County San Diego Easter Egg Hunts, Easter Brunches and Easter Events. 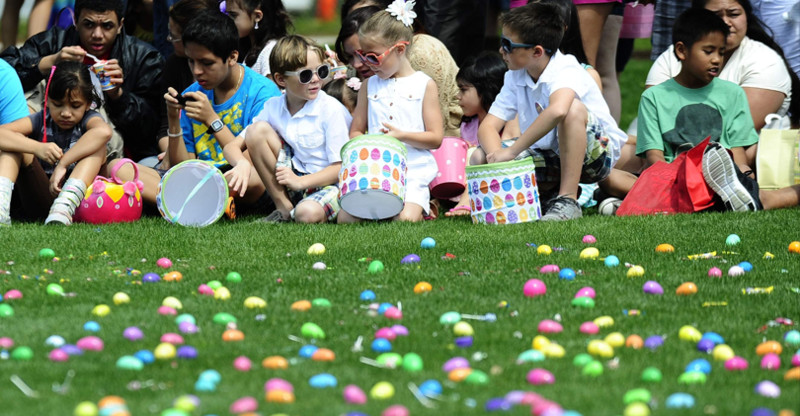 We showcase Easter Events and Easter Egg Hunts in San Marcos, Carlsbad, Vista, Escondido, Oceanside, Encinitas, Del Mar, Valley Center, Rancho Bernardo, Solana Beach, Fallbrook, Poway and Scripps Ranch. Some of these Easter activities begin as early as week before Easter, some the day before easter, and some on Easter day. Some of the events are free, and you just show up, some cost money and require you to sign up in advance. If you would like us to add a 2016 North County Easter Egg Hunt that is not in our list, please contact us at easter@santafehillssanmarcos.com. On Saturday, March 26 (8—10 AM), come and have breakfast with Peter Cottontail at “The Williams Barn” in Walnut Grove Park located off Twin Oaks Valley Road on the corner of Olive and Sycamore in San Marcos. Bring the whole family to enjoy this early morning chow-down of pancakes & sausage prepared by the bunny’s helpers. Tickets can be purchased at the door. $5 adults, $4 youth (10 & under). Immediately following the breakfast at 10:15 AM, toddlers through 5th graders are invited to the community “Spring Egg Scramble” where eggs with prizes will be well hidden by the bunny himself! Come early to have your picture taken with Peter Cottontail and enjoy carnival games and party jumps. Bring a bag or basket for each child. $5 donation per family. Easter Treasure Maps & Goodie Bags – Kids 12 and under, accompanied by an adult, are invited to pick up a free Easter Treasure Map at the Easter Bunny photo booth. Stop by each restaurant to have the map stamped. Then return it to the photo booth to receive a free Easter gift bag filled with candy and other goodies. Simply bring your camera or mobile device to capture a photo or video of your child with the Easter Bunny. Children visiting the bunny will receive a free balloon sculpture too. St. Mark Golf Club will serve Easter Brunch on March 27, 2016 from 9:00am-3:00pm. Brunch will feature breakfast favorites, scrumptious egg dishes, a carving station and a delectable dessert bar. Space is limited, reservations highly recommended. 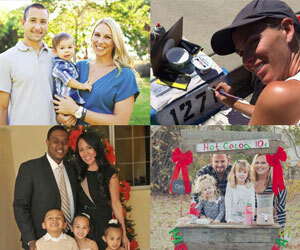 Call us at 760-744-9385. There will be an Easter Egg Hunt for children at 11am and 1pm. $39.99 adults, includes complimentary champagne. $15.99 kids 12 and under. Brunch @ 9 a.m., Easter Egg Hunts @ 11 a.m. and 1 p.m.
Come celebrate spring with music, fun games, arts and crafts and a Fun Zone with bounce houses, a giant slide, obstacle courses and a chance to “soak the bunny.” Collect eggs in the ongoing “egg scramble” activity. Children race to collect assorted eggs on the baseball fields. This activity sends groups of approximately 20 children of similar age into the out field to collect as many eggs as they can. There will also be samplings from the Parks & Recreation Summer Camps program. Instructors will be onsite to perform demonstrations and answer questions about their programs. Activity card must be purchased for $6 to participate in “egg scramble,” crafts, fun zone or bunny balloon soak.Unlimited fun zone wristbands are also available for $6. Food, beverages, and merchandise will be available for an additional cost. Bring your camera to capture the moment! Easter Egg Treasure Hunt runs from 12:30-1:30pm. Easter Bunny Visit and Arts & Crafts runs from 1:30-3:30pm. The Vista Easter Egg hunt is FREE and for kids ages 2 to 10. Festivities include face painting, bag decorating, games, and other entertainment. There will be prizes for opportunity drawings and refreshments available for purchase. Also look out for performances and demonstrations from Ballet Folklorico Tierra Caliente, Vista Skateboard Coalition, and the Karate Kids of America. The event is sponsored by the Pride of Vista Lions Club. The Annual City of Oceanside Easter Egg Hunt will be held at Buddy Todd Park, located at Mesa Drive and Parnassus Circle, on Saturday, March 26, 2016. The hunt will begin promptly at 10:00 am and is free for children ages 3-11. Families are encouraged to come early. There will be lots of candy, prizes, and of course, a special guest appearance by the Easter Bunny. It’s all about the kids! The City of Encinitas will present its annual Easter Egg Hunt Festival on Saturday, March 26 2016 at Encinitas Community Park from 10:00am to 1:00pm. Egg hunt times are: 10:15, 11:00, 11:45. Free children’s activities will be hosted by the City of Encinitas Parks and Recreation Department. We invite you to make a day of it and enjoy the beautiful new Encinitas Community Park. Please bring your own basket or bag for eggs. Limited parking is available on-site at the park. Auxiliary parking is available at the Scripps Memorial Hospital Encinitas lower parking lots, accessed off of Devonshire Drive. For more information, please call the City of Encinitas Parks & Recreation Department at 760-633-2740. Children ages 2 to 6 are invited to visit with our gentle bunny, pet real bunnies and chicks, and make some colorful spring crafts. Children will also parade through the garden and go on a bunny hunt. Parties are limited to 50 children, so pre-registration is required. Cost: Members $15 per child, non-members $18 per child. Regular admission fees apply to accompanying adult(s) payable upon arrival. Free admission for adult Garden members. Please pre-register online or in-person at our office. This event is free. Reservations are available on a “first come, first serve” basis for Del Mar 92014 residents and donors through March 20. If space is available after March 20, reservations will be open to persons residing outside of the 92014 zip code, until the event is full. On the day of the event, check in begins at 10:30 am. The Easter Egg Hunt begins at 11:00 am. Please note: you must be signed up to participate in this event. On March 19th come out to Rancho Bernardo Community Park with the whole family for our Annual Spring Fling Egg hunt. We will have 4 egg hunts, one for the little guys’ ages 0 to 3, as well as for 4 to 6, 7 to 9 and 10 to 12 year olds. There will be a bunny appearance, games, prizes, candy, food and other fun. This is a Free Community Event from 10:00 a.m. to 12:00 p.m. a part of our Holiday Extravaganza series. Solana Beach: Children’s Spring Festival & Egg Hunt for grades 3 and under starting 10:30 a.m. April 7 at La Colonia Park, 715 Valley Ave., Solana Beach. Games and refreshments 10:45 a.m. to noon. Free. (858) 720-2453. Savor a sumptuous buffet-style meal in the Beverly Mansion for the entire family. Children of all ages will enjoy the thrill of an outdoor Easter egg hunt following brunch, and photos with the Easter Bunny will conclude the day’s festivities. 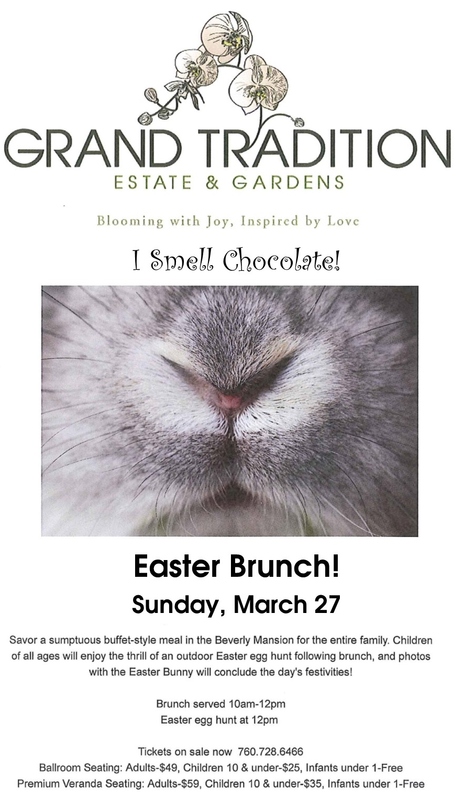 When: Sunday, March 27, Brunch 10am-12pm, Egg Hunt at 12pm. What’s cooler than your average egg hunt? A GLOW-IN-THE-DARK EGG HUNT! Join the quest to hunt one thousand glow-in-the-dark eggs. But, wait! These eggs will be filled with candy, gift cards, and tons of marvelous prizes. Don’t miss out! Register early; space is limited. On Saturday, March 26th, the Easter Bunny is hopping over to the Scripps Ranch Farmers Market. He will be on site from 11:00am to 1:00pm. Bring your cell phones & cameras & take as many pictures as you like with the Bunny. There will be a free Treasure Hunt for the kids & treats for everyone. Serving Breakfast & Lunch in the Bistro. Food court with 15 tables, chairs & umbrellas. For more information go to www.SRFM.org. There are 65 Vendors weekly. Regular market hours are 9:00am to 1:30pm, every Saturday.